Distributor: Licensed by Bandai, also available streaming at GundamInfo on Youtube and on Hulu. The story begins in Cosmic Era 71 on the neutral space-colony of Heliopolis during a then 11-month-old war between the Earth Alliance and ZAFT, each faction comprised of naturals and coordinators (enhanced humans) respectively. In an effort to gain some ground in the conflict, the Earth Alliance secretly developed 5 new mobile suits deemed Gundams. However, in an altercation that eventually culminated in the destruction of Heliopolis, 4 of the 5 Gundams fall into Zaft hands. The remaining Gundam falls into the care of Kira Yamato, a coordinator living among naturals. Together with his comrades aboard the Archangel, Kira battles tirelessly against ZAFT forces and the enemy Gundams, including one piloted by his best friend Athrun Zala, in order to secure the safety of his friends aboard the Alliance vessel. However, not all is as it seems, as new coalitions are formed and main characters change alliances throughout the course of Gundam Seed. It has been quite some time since the Gundam franchise produced a truly solid series. Ever since the transition from universal century (the same universe and timeline in which the characters of Mobile Suit Gundam existed) to alternate-universe Gundam series, viewers have been burdened with mostly less than stellar Gundam programming. Even the best alternate-universe shows have only managed to be as good as some of the worst work of the universal century era. That is, until now. With the arrival of Mobile Suit Gundam Seed fans are, for perhaps the first time, treated to a truly competent entry to the ranks of Gundam's alternate-universe. To begin with, the story line of Gundam Seed is quite capable. Gundam Seed borrows a good deal of the first half of its plot from one of the best sources imaginable, the original Mobile Suit Gundam (abbreviated as MSG for the duration of this review). For instance, both series begin with the inadvertent indoctrination of young, inexperienced, and unintended pilots (Amuro Rey for MSG, and Kira Yamato in the case of Seed) to the harsh realties of war when an attack on their respective colonies occur. Amuro and Kira each become adept fighters very quickly due to their inborn abilities and both strive to protect their respective vessels through various missions. And the irony and sadness of conflict always remains central to both tales. In fact, the similarities between MSG and Seed are extensive. 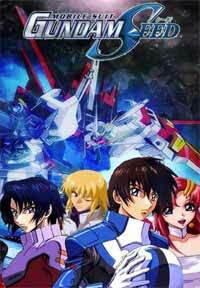 But rather than think of Gundam Seed as an impostor to the throne of MSG, I prefer to think of Seed's early half as incorporating much of what was good about MSG's story while adding its own unique slant. However, around the commencement of the latter portion of the series, Seed discovers its own voice. The prominence of borrowed plot elements from MSG begin to fade and more characteristic factors, such as the nature of struggle between best friends Kira and Athrun, take centerstage. It is at this juncture, though, that a minor problem, which I call "Too Coincidental Complex", rears its disagreeable face. Simply stated, there are too many coincidences to take some fragments of this story very seriously. But luckily most of the strongly coincidental moments are fairly easy to forgive. In addition, there are more than enough well-designed action sequences throughout the entire series (but especially in the latter half) to appease even the most ardent action buffs out there, though these action scenes always remain secondary to the narrative. The only sour lemon is that the storyline is sometimes plodding, principally during the middle episodes, but better that it be a little plodding than rushed. This concern is mostly insignificant come episode 34 though. Here the story picks up tremendously and continues to ride this momentum until the closing credits of episode 50. Unlike the plotting however, the characterization leaves a bit more to be desired. For one I just can't shake the sentiment that many of the players in Gundam Seed feel a bit artificial. It often seems as if most of the characters are intended to simply fill their stereotypical roles in order to move the story through its rounds. And then there is the issue of angst. Though the angst-level of the lead characters here isn't nearly as pronounced as those of Gundam Wing, it exists none-the-less and is a source of mild distraction. Kira, the show's primary lead, aside from being particularly angsty, is mostly a likable fellow and one of the show's strongest characters. Like his UC-universe doppelganger, Kira is a courageous young man that often questions his place in war and consequently feels fierce emotional conflict within himself. The same is true of Athrun Zala, Kira's best childhood friend and, at least initially, one of his fiercest enemies on the battlefield. The complex, malevolent relationship between Mwu La Fllaga and Raww Le Klueze is particularly absorbing. Their connection, along with the malicious intent of Raww Le Klueze, becomes meaningful to the primary conflict of the series. Also, there is fair amount of character growth during the course of this tale. Despite the above, Seed in general lacks a very strong supporting cast, the performance of which is mostly only adequate. This is not such a big deal though as the plot and the leads are mostly quite strong. As for some of its more unique characteristics, Gundam Seed is animated beautifully, by-and-far the best of any Gundam Series to date. Aside from some less-than-seamless CGI graphics integration, Seed manages to be quite visually stunning. In addition, the character and mecha designs are very good. I am especially impressed with the unique type of weaponry the Gundams are capable of utilizing. From invisibility (Blitz Gundam) to the wielding of energized broadswords (Strike Gundam) to the brandishing of a multitude of firearms that can be used simultaneously (Freedom Gundam), these Gundams can do it all. Musically, this series is also sufficiently gripping. The soundscape is exceedingly appropriate, as I can't recollect any moments in which the music felt out of place. The incorporation of some of j-pop's hottest music groups into the musical landscape was also an exceptional move. Truly, the peripherals of this show are top-notch. In the end, I suppose that Gundam Seed will not be palatable to all takers. The degree to which it appropriates material from past Gundam series will invariably be disliked by some. The sluggish pacing of some portions of the story line will be frustrating to others. But after all is said and done, I believe that Gundam Seed is a very worthwhile venture. It has enough originality to distinguish it from earlier Gundam ventures while retaining enough familiar features to connect it to the Gundam shows we already know and love. My final judgement: Gundam Seed is hands down the best alternate-universe Gundam series to appear yet, and one of the better series in the entire Gundam universe. Recommended Audience: Though not really bloody, at least until its latter half, Gundam Seed is complex enough that young children will not find favor in it. There are some sexual situations that are almost entirely implied and thus not at all graphic. Other than that nothing is particularly offensive or inappropriate. Thirteen years old and up for appropriateness.